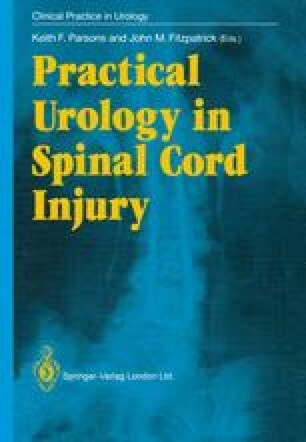 The outlook for patients following traumatic injury to the spinal cord has changed dramatically in the past 70 years and this has been due in large degree to improvements in the prevention and management of urosepsis. Earlier this century, the mortality in patients who had suffered spinal cord injury was 80% and, in the majority of cases, death resulted from infection of the urinary tract (Thompson-Walker 1917). Today, mortality in acutely injured patients is less than 5% and this usually results from respiratory failure, multiple injuries or pulmonary emboli (Grundy et al. 1986). There are two principal reasons for the improved prognosis in these patients. First, the realisation that the spinal cord injured patient is acutely unable to drain the urinary tract and is therefore prone to bacterial colonisation of urine resulted in artificial drainage becoming a priority in the acutely injured patient, with consequent diminution in the incidence of fulminant sepsis. Second, the development of potent antimicrobial agents has meant that infection, where it occurs, can be treated and the resulting renal failure prevented.